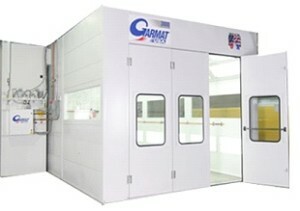 The Occupational Safety and Health Administration (OSHA) defines a “spray-finishing operation” as the “employment of methods wherein organic or inorganic materials are utilized in dispersed form for deposit on surfaces to be coated, treated, or cleaned.” Since most body shops use paints in their spray-finishing that contain isocyanate, which is an irritant to both the eyes and the respiratory tract, there are necessary regulations when it comes to working around them. The most important safety measure you need to take is to make sure you are using properly designed and maintained spray booths and rooms. Along with that, an air-fed breathing apparatus (BA) also needs to be utilized to maintain safe working conditions. Since we desire to keep the shop dust from entering the spray booth, we prefer to operate them at a positive pressure to their surroundings. The OSHA 6H ruling states this is allowed as long as the booth pressure system is automatically adjusted. If yours does not operate automatically and you have to operate a switch to adjust the pressure then the ruling states you must operate in a negative pressure. John Baker Sales can modify your control system to allow it to automatically control the booth pressure. Importantly, it should always be obvious whether or not the spray gun is being used to those outside and how long ago it was last used. In order to keep yourself and your employees safe, it’s essential to follow basic spray booth workplace safety guidelines. There’s a lot that goes into regulating your spray booth safety. If you are in need of properly designed spray booths and spray booth filters in Boise, ID, you can count on JohnBakerSale.com to provide you with quality equipment that’ll keep your workplace safe. Visit our website today.